olks, I have a special treat to announce today. But first, a little background. 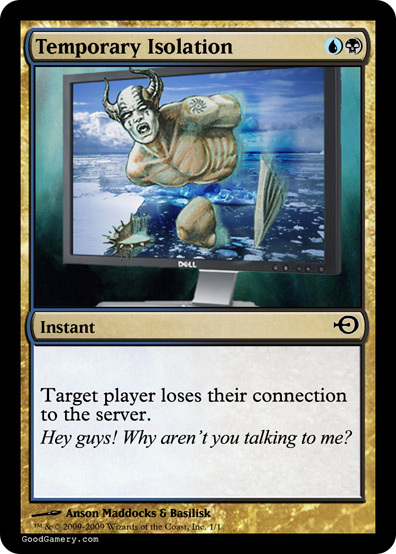 Those of you that play Magic Online know two things: Magic Online is a terrific product; and it doesn’t always work as well as we’d like. We believe that, like the economy, Magic Online is fundamentally strong. Sure, it’s had hiccups. Sure, it’s had ups and downs. But at the core is an incredible play experience that brings together players from all over the world from a variety of backgrounds, and lets them duel as though they are sitting in the same room. We decided we wanted to thank the players that have stuck with us through the tough times, and now have a front row seat for V3, the most stable Magic Online platform ever. Now that we’ve worked out the kinks, I think we can all look back with a sense of humor and have a laugh. I’m proud to announce the third Un-expansion: Unavailable. Unavailable is the first product exclusive to Magic Online. That’s right: it will not be sold in stores, and will not be redeemable. Unhinged, after all, was only available in cardboard, and this is the same principle. Much like the Astral set from Microprose, we will take advantage of the unique features of online play and translate them to Magic in ways that simply can’t be duplicated in cardboard. The design began nearly two years ago. Justin Ziran (Gamer Zer0), was at the time the Brand Manager, and he approached me with the idea of putting together a set to try and lighten the mood online, since he felt like the feedback he was getting from the community was somewhat negative. We went with an approach that felt like a winner, a one-two punch of top Magic designers, and experts in Magic Online. Mark Rosewater – I was Lead Designer for the set. This shouldn’t come as a great surprise. I was also Lead Designer of Unglued and Unhinged. Having written for Roseanne, I know funny. And any time someone has a good idea, I’m pretty quick to take credit. I may not have ever played Magic Online, but I’m pretty sure the skills translate. Justin Ziran – Justin was the Brand Manager and Community Liaison, and as such, knew the feelings of the Magic Online community better than anyone. I have always been impressed with Justin’s ability to create just the right tone with players, and to strike a balance between the needs of the community and the needs of the company. I really don’t know what we would do without him. Devin Low – An all-star Magic Designer. Devin is the kind of guy who instinctively knows what players want, even if they don’t quite realize it themselves. With his finger on the pulse of the Magic community, he is utterly irreplaceable. Jenna Helland – Jenna is a flavor guru, but more importantly, Jenna was the lead designer for the User Interface for Magic Online V3. As such, she was uniquely qualified to recreate the classic look and feel of the Magic Online experience. We wanted the cards themselves to reflect the intuitive familiarity of online play. Unavailable features several new mechanics that reflect the nature of online play. One of the most fun is Ban. 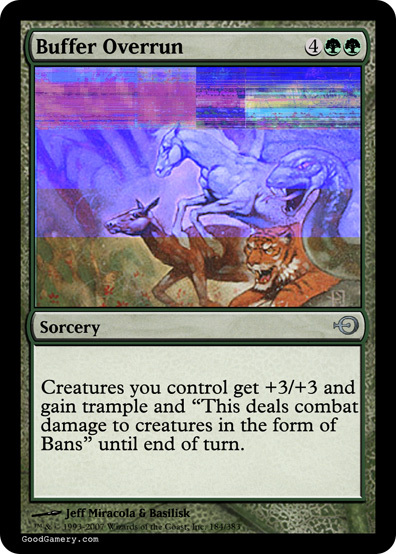 Any time a card is Banned, it will be, well, banned. That means it will instantly disappear from play, your hand, your library, your graveyard, in fact from all zones. This will affect every player in the game, and will last for the rest of the match. That’s right, it will carry over into the next game. Another powerful new addition to your arsenal is Edit. Mages have long been able to change certain words on card, typically related to color or land type. 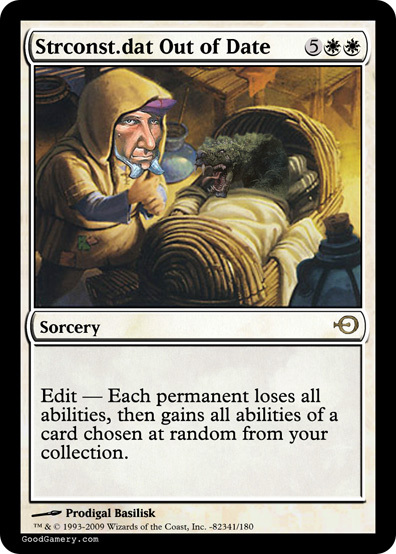 Now, Edit allows you to change the text of a given card is all-new ways, such as swapping abilities, doubling, them or removing them outright. Not all new cards focus on a new mechanic. Some harken back to the old days and poke a little fun at some problems that you may have forgotten ever happened. 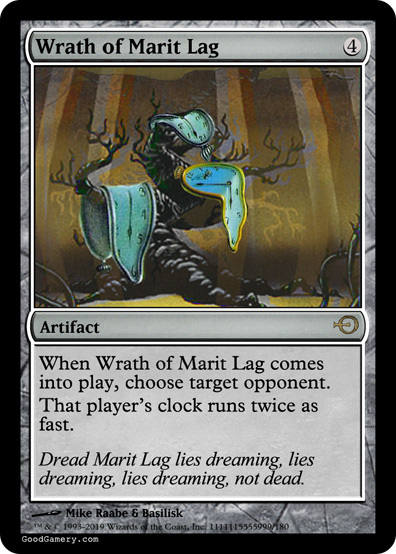 Finally, there is a subtheme that players have been clamoring for ever since we hinted at it in Future Sight. 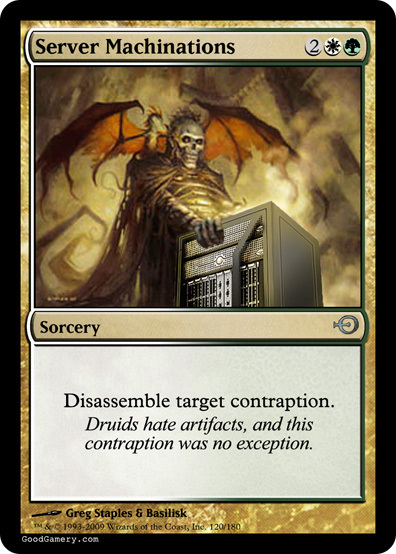 Many people had guesses about what it would mean, but now you know for sure: The Magic Online game servers have been nicknamed Contraptions for years now! You’ve gotten a taste of what’s to come, but I’d like to leave you with some hints. You won’t believe what we’ve held back. A 13/13 creature for 2 mana. Hint: its creature type is “Crasher”. A way to make your opponent’s cards non foil – permanently! The first ever “rating matters” card. I think all of you are going to get a real kick out of this set. I know it’s been a long road, but we’re finally a place of stability and consistency, and all of you are a big part of why that came to be. Without your positive feedback and steadfast loyalty, I don’t even want to think about where we’d be. Hopefully, giving you this set will let you know just how much we listen to you. Until then, may your client be stable, your packs be winners, and your rares be cool.